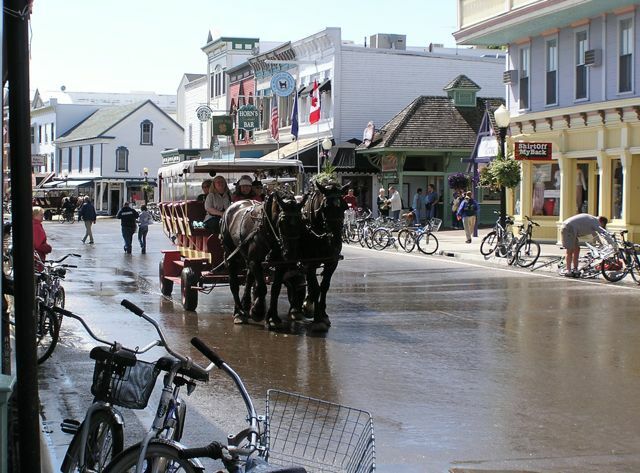 Michigan’s Mackinac Island – Scenic, Romantic and Bike-a-licious! Mackinac (pronounced mak’ in aw) Island is one of the gems of America, a 3.8-square mile preserved historic paradise where so many mid-westerners have honeymooned. 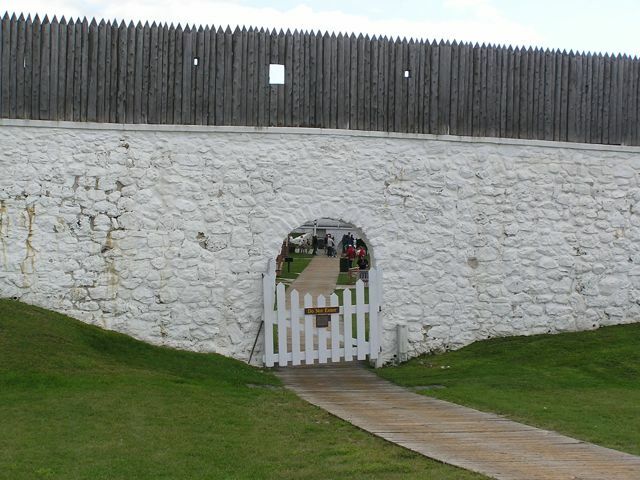 It’s located in Lake Huron at the eastern end of the Straits of Mackinac between the Upper and Lower Peninsulas of Michigan, with a history spanning from Native American settlements to European fur traders, and then as the strategic Fort Mackinac during the American Revolutionary War. It also saw two battles during the War of 1812. 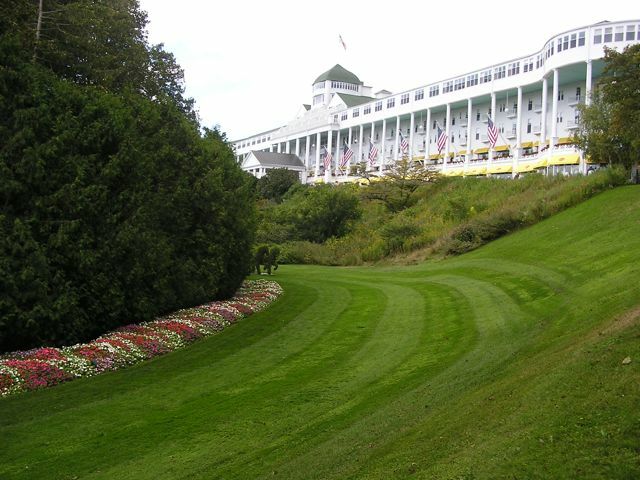 In the late 1800’s the island became a popular summer resort centered around the Victorian Grand Hotel, which remains as one of the many historic monuments including Fort Mackinac. The island is one of the most popular tourist destinations in the region, with lovely restored inns, restaurants, shops and nightclubs centered around the main village lined with Victorian-style buildings. 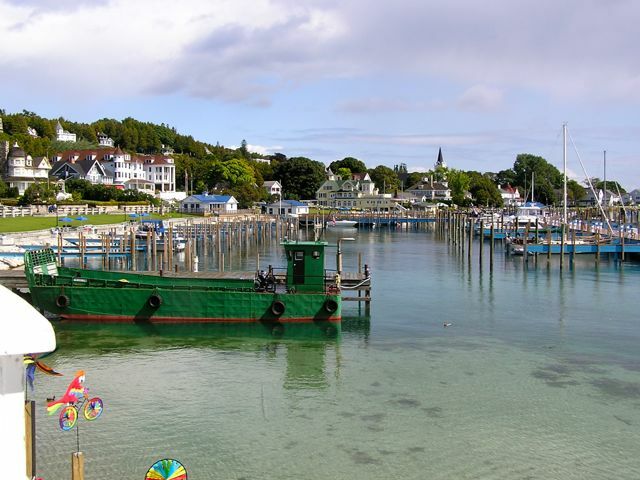 Access from the mainland is mostly via bike/ped ferries that transport some 15,000 visitors daily in summer from St. Ignace, north of the impressive Mackinac Bridge that spans the two halves of Michigan, and from Mackinaw City south of the bridge. 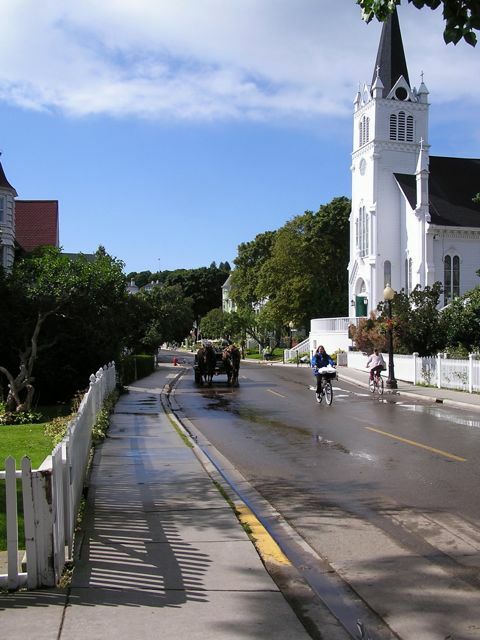 We love Mackinac Island because of the easy scenic cycling of course. The only vehicles allowed are emergency and service vehicles. Everyone else travels about the island by foot, via horse-drawn carriages, and of course bicycles. The 8-mile State Highway 185 is the only state highway in the US that does not allow motor vehicles. It follows the perimeter shoreline of the island, from the village to the foot of forested hillsides, with views in all directions, including the mainland to the west through the northeast, Mackinac Bridge to the southwest, other islands to the south, and the vast expanse of Lake Huron to the east. It’s a delightful bike ride, only tempered by the results of…well, remember those horse-drawn carriages? You might finish the 8-mile perimeter ride relatively quickly, so you can of course do it again, or if you are in for a bit of a workout, cycle through the interior roads which are hillier, reaching a maximum elevation of 300+ feet. The majority of the island is a state park, and there are any number of historic sites to keep you touring happily, followed by a meal at a waterfront restaurant downtown. And of course don’t forget to sample the famous fudge. Several websites give you a rundown of options for your trip. 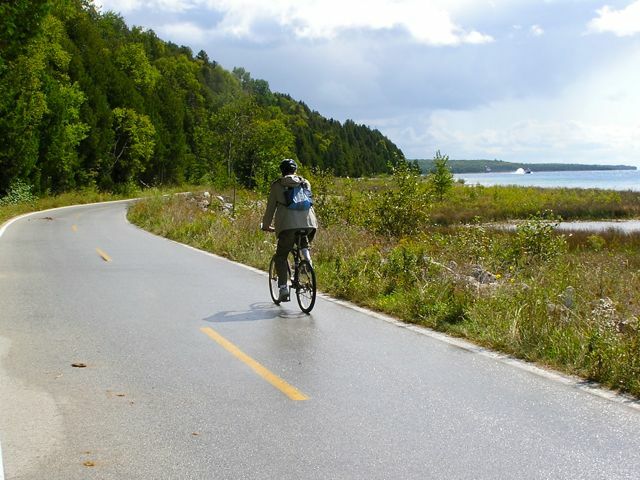 A popular cycling event is the annual Zoo-de-Mackinac held in May that includes a ride along the Michigan mainland coastline and a trip over to the island for more cycling and parties. Lovely village center showing modes of transport via bike and carriage. Boat harbor as seen from a waterfront restaurant. Typical street scene in the village. Pedaling along the perimeter road bike route. Kind of reminds one of the ride around Stanley Park in Vancouver BC, but much longer. 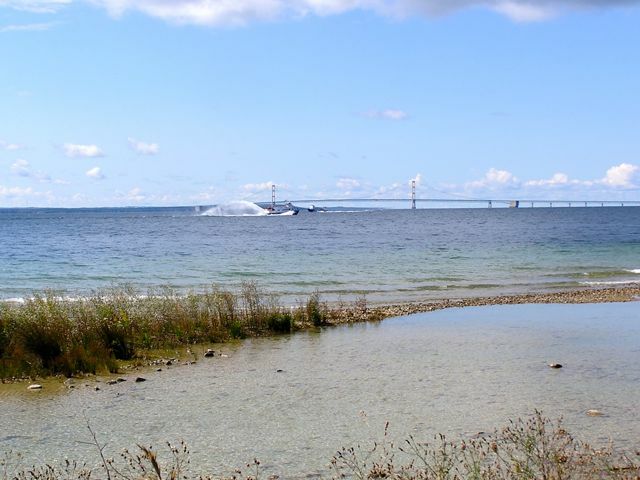 From the perimeter road, a pedestrian ferry roars across the water, with the Mackinac Bridge behind, giving a perspective of the island’s location. The Grand Hotel, some call it a “bucket list” splurge to stay here. They charge a fee even to walk on the grounds and come inside. Preserved historic site, Fort Mackinac, up the hill from town.